Looking for privacy and security? Situated in one of Washington Township's finest locations, w/ panoramic views from one of Dayton's highest points, this RA Rhoads custom built 2-story home in the gated community of Terrace Creek sits on 3.3 acres of lush grounds & nature. 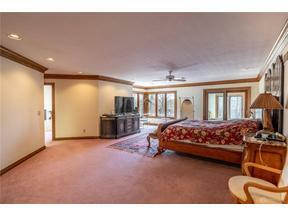 With almost 8000 SF of living area, the main floor has a 27x19 master suite w/ a huge exercise rm, hot tub & steam bath. The exposed lower level offers a guest bedroom & full bath, a 33x19 recreation rm, 17x14 game rm and 21x17 storage rm. There is a heated, paver driveway w/ temperature sensors, a paver walkway, Pella windows & doors. Other features include a sprinkler system, security system, low voltage exterior lighting, solid 6 panel interior doors w/ over-sized moldings, 6 inch gutters, 3 HVAC units, 2 water heaters, & 9 ft basement ceilings. Outside are 3 decks, pergola & gazebo plus waterfall and fountain. Nothing but the finest quality craftsmanship & materials.